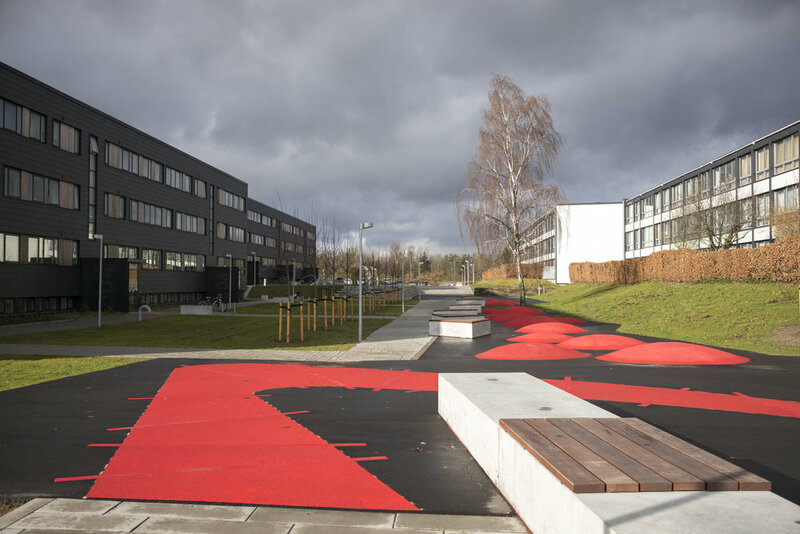 The renovation of Langkærparken is a model example of how a holistic social approach and ambitious climate goals can enrich a residential area - both through the architecture, the technical solutions and during the construction process itself. Like many of its contemporary buildings, Langkærparken was generally worn down and characterized by concrete damage and outdated building surfaces, dwellings and recreational space. Architecturally – through citizens involvement and increased accessibility. Technically – through ambitious climate and low energy targets. In execution – through engagement of the young and unemployed in the area at the site of construction. The renovation was completed as a two-stage racket. The first phase was a pilot project with a single block as a test block for an ambitious energy innovation under the motto "Common Housing for Combating Climate Change". This phase was followed by the major renovation on the remaining 34 blocks. How does the project contribute to NBO-Housing Nordic's vision of economically sustainable housing for all people? Disadvantaged young people in vulnerable residential areas are associated with extra costs. Both in the terms of direct costs in connections to vandalism and burglaries and indirect costs related to the insecurities that arise among residents. Prio to the initiative Langkærparken had major expenses to vandalisme, numerous car thefts and burglaries. In the last quarter up to construction start-up it summed up to 22 burglaries and expenses worth 421,000 D.Kr. With the prospect of annual expenses to vandalisme exceeding over one million D.kr. and concerns that these costs would increase further due to the decision not to relocate residents during the extensive renovation, it was crusial that the youngsters from the area gained ownership of the extensive renovation of Langkærparken. A total of 24 young people were employed full time during the renovation as unskilled staff or in apprenticeships – many of whom had a criminal record and was socially maladjusted in different ways. At first, naturally, residents was reluctant to give the youngsters access to their homes, even if in work uniform. Slowly the youngsters gained the trust and respect of the residents and the result was amazing - throughout the renovation period only a single burglary in a car on the construction site took place, no burglaries in the apartments and only one example of theft from the construction site was detected. The latter was prevented by the local youngsters themselves - as they observed someone from outside steeling cables. Subsequent to the renovation, expenses to vandalism have dropped to 30 percent, and burglaries in cars or apartments happen rarely. How does the project contribute to NBO-Housing Nordic's vision of ecologically sustainable housing for all people? The entire area has undergone an extensive energy renovation by means of a high-insulated climate screen, new insulation in the roof, just like the socket has been insulated from the outside. Windows have been replaced with high-power energy windows. On the roof you’ll now find Denmark's largest solar power plant – 34 housing blocks with solar panels on the rooftops that produces electricity for the residents – consumed by individual apartments and by local laundries. In addition to the economic benefits for residents – No rent increase – the huge solar panels are also expected to result in a reduction of CO2 emissions at around 315 tons of CO2 per year. Furthermore residents can track the production of electricity online. 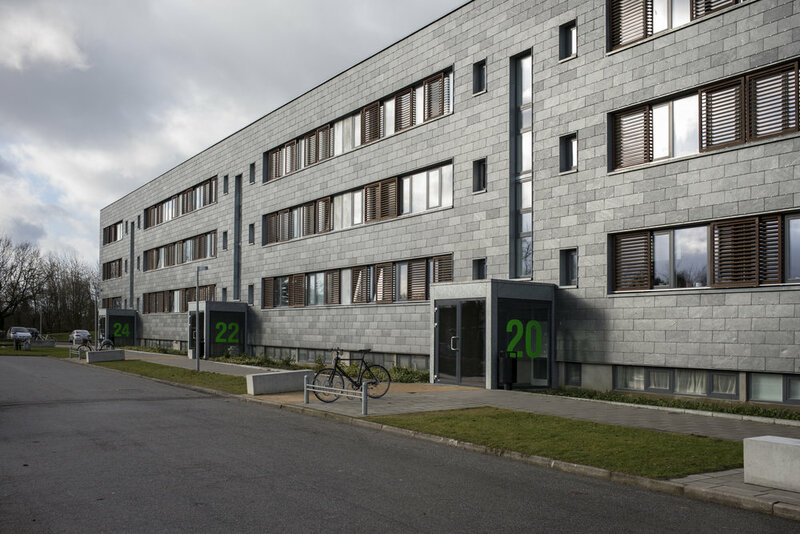 How does the project contribute to NBO-Housing Nordic's vision of socially sustainable housing for all people? Job First is considered both an employment and social project. It is well-known that many young people of other ethnic background grow up with their feet planted in two different cultures. For the vulnerable youngsters of other ethnic background, this often becomes negative because they feel different, not accepted and without the opportunity to establish the life they want. In Langkærpark, it was experienced as a frustration and the beginning of a counterculture - "If you do not want me, I will also reject you very clearly". A counterculture of this type, will usually burden the entire environment of the dwelling as it results in vandalism, crime and a general sense of insecurity among residents. Inclusion in a workplace can be a very effective measure of inclusion in society. The young people are removed from their usual comfort zone and forced to be part of a common understanding and adapt to a different set of norms. One year in the project, 80 percent of young people were still in work - this would not be possible without extensive adaptation and learning. Even for those who did not stay in jobs there had been a change - exemplified by one of the young people who stated "Now I know that it's my own fault that I do not have a job". The extensive reduction in burglary and vandalism tells a story of a group of young people who has become more included in society - and that social sustainability has increased in the settlement.